Introduction The epidemiology of gender differences for mesothelioma incidence has been rarely discussed in national case lists. In Italy an epidemiological surveillance system (ReNaM) is working by the means of a national register. Methods Incident malignant mesothelioma (MM) cases in the period 1993 to 2012 were retrieved from ReNaM. Gender ratio by age class, period of diagnosis, diagnostic certainty, morphology and modalities of asbestos exposure has been analysed using exact tests for proportion. Economic activity sectors, jobs and territorial distribution of mesothelioma cases in women have been described and discussed. To perform international comparative analyses, the gender ratio of mesothelioma deaths was calculated by country from the WHO database and the correlation with the mortality rates estimated. Results In the period of study a case list of 21 463 MMs has been registered and the modalities of asbestos exposure have been investigated for 16 458 (76.7%) of them. The gender ratio (F/M) was 0.38 and 0.70 (0.14 and 0.30 for occupationally exposed subjects only) for pleural and peritoneal cases respectively. Occupational exposures for female MM cases occurred in the chemical and plastic industry, and mainly in the non-asbestos textile sector. Gender ratio proved to be inversely correlated with mortality rate among countries. Conclusions The consistent proportion of mesothelioma cases in women in Italy is mainly due to the relevant role of non-occupational asbestos exposures and the historical presence of the female workforce in several industrial settings. Enhancing the awareness of mesothelioma aetiology in women could support the effectiveness of welfare system and prevention policies. The awareness of occupational or environmental origin of mesothelioma in women could improve the efficiency of the public compensation system and the prevention policies, redefining the tools for investigating asbestos exposure in a gender perspective. The main purposes of this study are to study the gender ratio among MM cases registered by ReNaM and to assess the specific patterns of incidence and asbestos exposure in women. 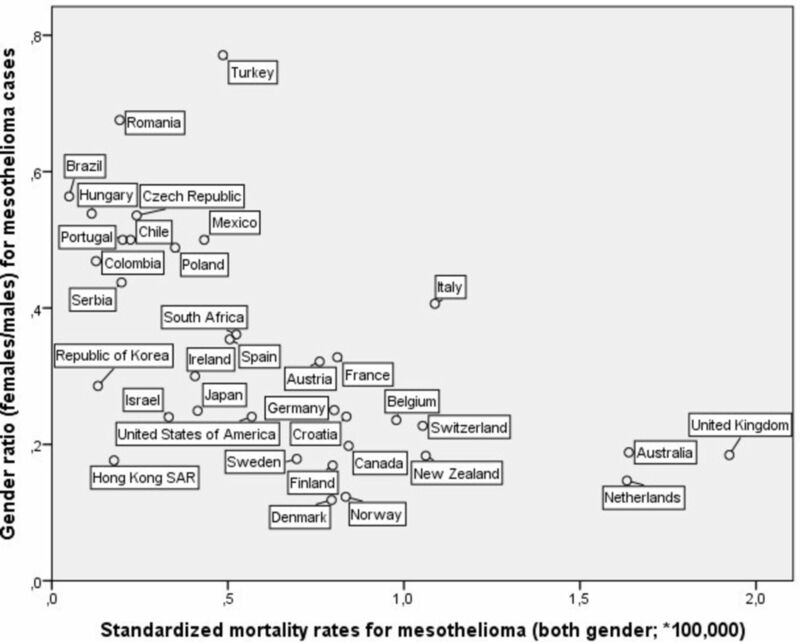 Moreover, mortality data will be used to compare the internationally gender ratio of mesothelioma among countries. Incident cases of malignant mesothelioma in women attributed to occupational asbestos exposure are analysed by activity sector and job. For each case exposures with the highest level of likelihood as coded by CORs’ expert hygienists were considered and multiple exposures with the same likelihood level (but occurring in different sectors or in different jobs within the same sector) were taken and analysed separately. Only sectors with at least 20 MM cases in women are presented and for each sector the most frequent five jobs are reported. The F/M ratio for the considered occupational sectors has been also calculated. 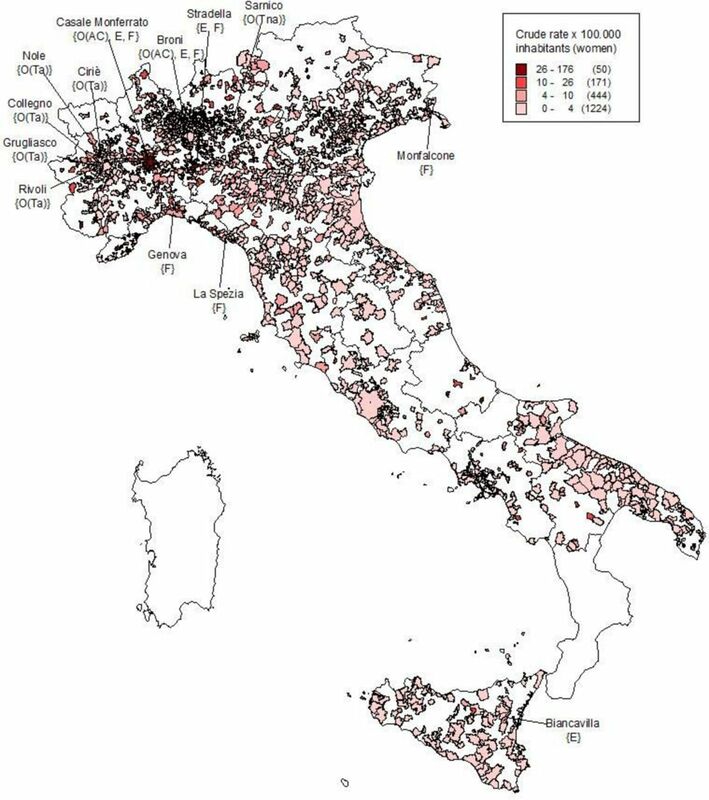 Only for Italian regions collecting incidence data, as specified above, the territorial distribution of female mesothelioma cases according to municipality of residence at diagnosis is mapped. The crude rates have been calculated for the Italian municipalities with at least one mesothelioma case in female residents (n=1889), considering the cumulative population during the incidence period between 1993 and 2012 as denominator. Because of the extreme territorial details, no standardisation of incidence data is performed and the incident cases are simply divided for the general resident population (according to person-years of observation). Only for municipalities with more than eight female incident cases in the considered period and a crude rate higher than four per 100 000 inhabitants the predominant modalities of exposure (occupational, environmental or familial) are labelled. Furthermore, where occupational asbestos exposures are predominant the economic activity sector with the greatest number of cases is indicated. National figures on mesothelioma incidence are too few to admit international comparisons. With the scope to perform international comparative analyses, we extracted therefore the numbers of deaths for malignant mesothelioma (ICD-10 category C45) from the WHO mortality database (www.who.int/healthinfo/mortality_data). Data referring to 2011 have been selected because it was the most recent year with availability of data for a sufficient number of countries and only countries with at least 20 mesothelioma deaths in both genders are included in the analysis. Standardised mortality rates are calculated after retrieving resident population for all countries from the WHO database and considering world population as reference (WHO mortality database available at www.who.int/healthinfo/mortality_data). Gender ratio for all countries as the ratio between the number of female and male MM deaths (F/M) has been calculated and plotted as a dispersion graph with mortality rates. Different regression curves have been tested to identify the best predictor model according to goodness of fit (R2). For all statistical analyses we used SAS, version 9.3 (SAS Institute Inc., Cary, NC, USA), and IBM-SPSS, version 22.0 (IBM SPSS, Armonk, New York, USA) packages for statistical analysis. In the period between 1993 and 2012 a case list of 21 463 MM has been collected with a national standardised incidence rate for pleural forms in 2011 of 3.64 (per 100 000 person-years) in men and 1.32 in women. Pleural site is reported in 93.3% (19 955 cases) of recorded MM cases: peritoneal and pericardial cases represent 6.5% (1392 cases) and 0.3% (51 cases) of the whole caselist respectively. In the ReNaM archive there were recorded 65 cases of mesotheliomas of tunica vaginalis of testicular site, which have been excluded from the analyses. Data presented are therefore referring to a total of 21 398 MM cases (6087 women and 15 311 men; overall F/M=0.40). The gender ratio (F/M) is 0.38, 0.70 and 0.46 for pleural, peritoneal and pericardial cases respectively (table 1). The number of female pleural MMs is proportionally higher in the oldest group of cases (>85 years' old): it remains unchanged in the whole period of observation (1993–2012). Gender ratio is lower than the overall value for the pleural cases with histological confirmation and for cases with fibrous or biphasic morphology. The modalities of asbestos exposure have been investigated for 16 458 mesothelioma cases (76.9%). This percentage is not consistent across regions but shows a great territorial variability (higher than 90% in Lombardy, Tuscany, Apulia, Umbria, Veneto, Bolzano and Trento provinces: lower than 50% in Sicily, Campania and Calabria). The availability of exposure information was also different by gender (78.9% in men and 71.9% in women). In the 52% of cases investigated for exposure (n=8561), the interview has been conducted directly with the affected person, but this percentage is lower in women (45.9%) than in men (54.2%). We found that 86.9% of male mesothelioma incident cases, for which the assessment of exposure has been completed, had been exposed to asbestos (61.4% for female cases) and 95% out of them were occupationally exposed (54.3% for female cases). Among occupationally exposed MM cases the gender ratio is equal to 0.14 and 0.30 for pleural and peritoneal forms respectively. Pleural and peritoneal MM cases of non-occupational origin (familial, environmental and leisure time circumstances) show an F/M ratio significantly higher than occupational cases but similar to the one observed in unknown or improbable asbestos exposed cases (table 1). No significant temporal trend is found in exposure pattern as well as in age distribution by gender (data not presented in detail). For pleural MM, mean age at diagnosis is higher in women than in men among cases either with occupational or non-occupational exposure (70.5 vs 68.8 years and 69.3 vs 66.4 years respectively). Within the latter group the difference in age at diagnosis is mostly evident in familial cases (68.9 years in women vs 64.2 in men), but not significant in environmental and leisure time exposed (data not presented in detail). Latency lasts 50.5 (SD=12.5) years on average for pleural female cases occupationally exposed but 47.9±11.1 years in men, whereas it is very similar in peritoneal cases between genders (46.0±11.8 and 45.7±10.5 for female and male occupational MM cases respectively). Occupational exposures for female mesothelioma incident cases occurred in a large number of economic sectors including the asbestos industry, but also other industrial settings, such as the chemical and plastic industry, and mainly the non-asbestos textile sector (table 2). The latter was in particular identified as causing asbestos exposure in more than 40% of both pleural and peritoneal MM female cases of occupational origin. Gender ratio (F/M) of MM cases is higher than one for the textile industry (with or without direct use of asbestos in the industrial cycle: 3.08 and 1.27 respectively) and the garment industry (2.77). Among jobs more frequently causing asbestos exposure in women there are blue-collar workers but also farmers, tailors and dressmakers, ironers, clerks and teachers (table 2). Looking at the territorial distribution of MM cases recorded by ReNaM, the F/M ratio varies among regional case lists from 0.56 to 0.57 (Piedmont, Lombardy) to 0.19 to 0.23 (Liguria, Friuli-Venezia Giulia) reaching the minimum value in Umbria (0.11) but based on a limited number of cases in this region in the 1993 to 2012 period (n=92). Figure 1 shows the territorial map of crude incidence rates for mesothelioma in women. Based on female MM absolute number of cases and crude rate (see selection criteria in Methods for details), 13 municipalities were identified and characterised for exposure modality: Monfalcone (F/M=0.3) in Friuli-Venezia Giulia; Genova (0.2) and La Spezia (0.1) in Liguria; Casale Monferrato (0.8), Grugliasco (0.8), Collegno (0.9), Ciriè (1.2), Nole (1.2), Rivoli (0.9) in Piedmont; Sarnico (1.4), Broni (0.8) and Stradella (1.6) in Lombardy; and Biancavilla (0.9) in Sicily (figure 1 and table 3). Crude incidence rates (*100 000 inhabitants) for malignant mesothelioma in women by municipalities of residence at diagnosis. Municipalities with significant number of cases and modalities of asbestos exposure in women. Italian national mesothelioma register (ReNaM), Italy, period of incidence 1993–2012. Labels are reported for municipalities with crude incidence rates>4 and at least 8 MM female cases with occupational or non-occupational (environmental, familial, leisure activities-related) exposure. Labels show the municipalities and the modalities of asbestos exposure: O(Ta) prevalently occupational exposure in asbestos textile sector; O(Tna) non-asbestos textile; O(AC) asbestos-cement plant; O(S) shipbuilding and repair; E environmental exposure; F familial exposure, due to cohabitation with exposed workers. When comparing mesothelioma mortality among countries, gender ratio (F/M) results to be inversely correlated with standardised mortality rate (b=−0.22; R2=0.35; p<0.001) in the linear regression model, that presents the highest goodness of fit value among all tested regression models. All considered countries tend to show a linear decrease in F/M ratio for increasing mortality rate. In the selected 36 countries, the percentage of female cases among mesothelioma deaths varied from 10.6% in Denmark to 43.5% in Turkey, whereas the overall raw mortality rate (both genders) ranged from 3.7 per 100 000 cases in the UK to 0.04 in Brazil. Italy shows a pattern with a number of women involved higher than expected according to the model (figure 2). Standardised mortality rates for malignant mesothelioma (both genders) and gender ratio (F/M). Based on ‘WHO mortality database’, year=2011; only countries with more than 20 cases. As a legacy of the massive use of asbestos until the ban in 1992, Italy is today one of the countries suffering most from the occurrence of asbestos-related disease. Thanks to a long-term epidemiological surveillance of MM incidence, which covers almost completely the Italian territory, our study found out that about 28% of mesotheliomas in Italy occurs among women with a F/M ratio equal to 0.40 which is almost steady over the whole considered incidence period (1993–2012). Specific surveillance systems comparable for information completeness, exposure assessment and territorial coverage are scarce and, to the best of our knowledge, currently ongoing only in Australia, France and South Korea.22 A gender ratio equal to 0.24 female cases for each male case is reported in Australia based on 518 MM cases among men and 123 in women diagnosed in 2014.23 The French National Mesothelioma Surveillance Programme (PNSM) currently recording incident MM cases in 26 French geographical districts, accounting for about a quarter of the French population, provides a distribution of 1526 MM incident cases among men and 411 among women in the 1998 to 2008 period (F/M ratio=0.27). For mesothelioma female cases without identified asbestos exposure, occurring in areas with recognised occupational asbestos exposure in males, environmental contamination has been advocated as a reasonable explanation for exposure.8 This hypothesis seems supported by the findings of an exploratory analysis of 318 female malignant pleural mesothelioma cases recorded by the French surveillance system between 1998 and 2009, suggesting a relevant causal contribution of non-occupational asbestos exposure (para-occupational and environmental exposure) in those women never occupationally exposed.13 In South Korea a total of 399 MM cases were identified from 2001 to 2010 (264 men and 135 women with a F/M ratio of 0.51).24 The relatively high proportion of female cases of mesothelioma in South Korea has been discussed with regard to the environmental exposure to asbestos and to the relevant female workforce in asbestos textile factories in the 1970s and 1980s. By performing international ecological comparisons, it is remarkable that a clear and significant correlation has been found between the proportion of female mesothelioma deaths and the overall mortality rate. In countries with higher mortality for pleural mesothelioma, reflecting in turn a greater level of asbestos use for industrial activities in the past, such as the UK, Australia and several Western European countries, a lower F/M ratio is actually observed. Conversely, in South American countries, Turkey and Eastern European countries a high proportion of female MM deaths is associated with relatively low MM total mortality rates. This finding seems to indicate that the higher was the industrial use of asbestos in the past, entailing mostly male-dominated workforces highly exposed to asbestos, the lower is the female share in mesothelioma occurrence. However, this interpretation must be considered with caution because of the possible underestimation of mesothelioma deaths due to diagnosis misclassification in low-mortality countries. In fact, a rare and difficult-to-diagnose disease such as mesothelioma can be underreported in mortality statistics.2 Moreover, despite the increasing number of countries reporting data to WHO, our analysis allows a limited representation or worldwide pleural mesothelioma mortality due to the absence of data from populous and industrially emerging countries such as China, India and Indonesia25 and from low-income countries as well. Looking at the specific Italian situation it emerges indeed that Italy shows an outlier profile within the international context, as depicted by ecological figures, having a percentage of female MM deaths higher than expected from the regression model. The availability of clinical and exposure information about MM incident cases occurring in the past decades from ReNaM can help in providing some possible explanations. Some limitations of the ReNaM dataset have to be discussed preliminarily. At the present, ReNaM is collecting MM cases in the whole of Italy, but activity of regional operating centres did not begin at the same time and this could have biased our study given the unhomogeneous territorial distribution of the sources of asbestos exposure (plants or environmental contamination sites). The ability and the effectiveness in identifying the modalities of asbestos exposure, despite the use of a shared structured questionnaire, is not fully consistent and the percentage of collected exposure histories varies between 45% and 95% among regions. Furthermore, the possible lack of homogeneity among CORs in classifying and coding diagnoses and exposures (according to the National Guidelines) is a crucial and real concern. The modality of asbestos exposure is the most relevant variable associated with gender ratio variation in ReNaM data. Occupational exposure is documented in a wide variety of sectors for female incident mesothelioma cases, that include traditional activities with a direct use of asbestos, but also those with indirect exposures related to the presence of asbestos in structural frameworks and machinery at workplaces. In Italy (particularly in Piedmont, north-western Italy) many asbestos- processing plants, with a relevant female workforce, were active in the past. However, it must be underlined that the high occurrence of mesothelioma cases in women employed in non-asbestos textile industries, which emerge as the most common economic activity associated with occupational mesothelioma among women at the individual level, as also reported in other studies.11 Occupational exposures in this sector is mainly due to the widespread use of operating machines with asbestos containing friction materials since the 1950s. Asbestos materials were also applied to ceilings and walls of factories in order to avoid both condensation of steam and reflection of noise and used to insulate the steam pipelines and some parts of the ironing equipment.26 27 Italy was, especially in the past, one of the leading producers and exporters of textiles and wearing products worldwide, so explaining in part the high occurrence of MM in women in this country. However, it must be noticed that the proportion of female MM-defined cases attributed to occupation in the ReNaM database is about 33%, most of ill women having experienced other modalities of asbestos exposure or remaining even with no causal definition. Furthermore, it is remarkable that a lower percentage of female MM cases were investigated for exposure by direct interview with respect to males and this could have affected the reliability of retrieved information that is evidently higher for direct interview. For female MM cases a possible source of exposure has been acknowledged in soiled work clothes brought home by occupationally exposed relatives.28 In Italy, the cohort study of wives of Casale Monferrato asbestos-cement factory workers found a high excess of deaths for pleural mesothelioma (standardised mortality ratio, SMR=18.00, 21 observed vs 1.2 expected).29 A female predominance has been reported among not occupationally exposed MM cases detected by ReNaM in the period of incidence 1993 to 2008, women accounting for about 57% of environmental and up to 85% of familial cases.30 The current analysis confirms the fundamental role of non-occupational exposure, and mainly of familial exposure in causing MM in women. In conclusion our study provides evidence of a consistent proportion of mesothelioma cases occurring in women in Italy. The reasons for such a figure are the relevant role of non-occupational asbestos exposures accounting for almost 30% of female cases investigated for exposure; and the historical presence of a relevant female workforce in the non-asbestos textile industry as well in various asbestos-containing product manufacturing industries. The great variety of jobs and domestic conditions potentially involved in asbestos exposure and the consequent difficulties in identifying occupational exposure and seeking compensation among women suggest the need to implement the tools (specifically the anamnestic questionnaire) to investigate the modalities of exposure in a gender perspective. Enhancing the awareness of occupational or environmental origin of mesothelioma in women by clinicians and healthcare operators could support the effectiveness of the insurance and welfare system, and benefit the exposure risks prevention policies.
. Almost half of women with malignant mesothelioma were exposed to asbestos at home through their husbands or sons. Dan Med J 2014;61:A4902.
. [The effectiveness of compensation system for mesotheliomas due to occupational exposure to asbestos and determinants for requests and awards: an evaluation based on record-linkage between the Veneto Mesothelioma Register and the claims and compensations recorded by the National Insurance Institute (INAIL)]. Epidemiol Prev 2011;35:331–8. , et al . eds. Linee guida per la rilevazione e la definizione dei casi di mesotelioma maligno e la trasmissione delle informazioni all’ISPESL da parte dei centri operativi regionali. Roma: Monografia ISPESL, 2003.
et al. , eds. Il Registro Nazionale dei Mesoteliomi (ReNaM). Quinto Rapporto. Roma: Monografia INAIL, 2015. Italian.
. Statistical methods for rates and proportions. 3rd edn: John Wiley & Sons, Inc., 2003.
. National epidemiological surveillance systems of mesothelioma cases Epidemiol Prev. 2016;40:215–23.
. [Malignant mesothelioma in garment sewing-machine workers]. Med Lav 2008;99:187–93.
. [Asbestos risk in the textile industry: final confirmation of data from the Lombardy Mesothelioma Registry]. Med Lav 2003;94:521–30.
. [The epidemiologic surveillance of malignant mesothelioma in the Lower Iseo Lake area]. Epidemiol Prev 2007;31(4 Suppl 1):16–22.
. [Something is missing: what’s wrong with using age at diagnosis/death or latency among cases]. Epidemiol Prev 2013;37:85–8. Contributors AM designed the study, performed statistical analyses, interpreted the data and drafted the manuscript, AB, MC, DD, AS, PF participated in performing statistical analyses and in interpreting the data, SI participated in designing the study and interpreting the data, MV, DM, VG, CM, GS, GM, EM, PG, CN, FD, AR, EC, SS, CP, RC, FS, ER, VA, LT, IA, DC, GC, FT, RT, MM collected data, defined asbestos exposure. All authors participated in revising the manuscript. Funding This research was supported and founded by INAIL (Italian Workers Compensation Authority). The units of epidemiology or occupational health hosting the Regional Operating Centres belong to the National Health Service and are financed by their health authorities. Competing interests The following authors reported that they have served as expert witness for the public prosecutor in court trials on asbestos-related diseases: EM, DM, SS, VG, CM, RC. Collaborators Detragiache E (Regional Operating Centre of Valle d’Aosta (COR Valle d’Aosta), Valle d’Aosta Health Local Unit, Aosta, Italy); Merletti F, Gangemi M, Stura A, Brentisci C, Cammarieri Diglio G, Macerata V, Gilardetti M (COR Piedmont, Unit of Cancer Prevention, University of Turin and CPO-Piemonte, Torino, Italy); Lazzarotto A, Benfatto L, Bianchelli M, Mazzucco G, Campi MG, Malacarne D, Camposeragno D, Di Giorgio F, Canessa PA (COR Liguria, UO Epidemiology, IRCCS Az. Ospedaliera Universitaria San Martino, National Cancer Research Institute (IST), Genova, Italy); Consonni D, Pesatori AC, Riboldi L (COR Lombardy, Department of Preventive Medicine, Fondazione IRCCS Ca’ Granda, Ospedale Maggiore Policlinico and University of Milan, Milano, Italy); Bressan V, Gioffrè, Ballarin M (COR Veneto, Occupational Health Unit, Department of Prevention, Padua, Italy); Chermaz C, De Michieli P (COR Friuli-Venezia Giulia, University of Trieste -Trieste General Hospitals, Clinical Unit of Occupational Medicine, Trieste, Italy); Mangone L, Storchi C, Sala O (COR Emilia-Romagna, Health Local Unit, Public Health Department, Reggio Emilia, Italy); Badiali AM, Cacciarini V, Giovannetti L, Martini A(COR Tuscany, Cancer Prevention and Research Institute, Unit of Environmental and Occupational Epidemiology, Firenze, Italy); Grappasonni I(COR Marche, University of Camerino, Hygienistic, Environmental and Health Sciences Department, School of Sciences of the drug and the products of health, Camerino, Italy); Masanotti G, D’Alo’ D, Petrucci MS (COR Umbria, University of Perugia, Department of Hygiene and Public Health, Perugia, Italy); Davoli M, Forastiere F, Cavariani F, Ancona L (COR Lazio, University La Sapienza, Department of Experimental Medicine, Roma, Italy); Di Giammarco A (COR Abruzzo, Health Local Unit, Occupational Medicine Unit, Pescara, Italy); Menegozzo S, Canfora ML, Santoro M, Viscardi F, Brangi A, Cozza V (COR Campania, Second University of Naples, Department of Experimental Medicine, Napoli, Italy); Vimercati L (COR Puglia, University of Bari, Department of Interdisciplinary Medicine, Section of Occupational Medicine ’B.Ramazzini’' Bari, Italy); Lio SG (COR Calabria, Public Health Unit, Crotone, Italy); Cascone G, Frasca G, Giurdanella MC, Martorana C, Nicita C, Rollo P, Spata E, Dardanoni G, Scondotto S (COR Sicily, Cancer Registry ASP Ragusa and Sicily Regional Epidemiological Observatory, Italy); Nieddu V, Pergola M, Stecchi S (COR Sardegna. Regional Epidemiological Centre, Cagliari, Italy).